Welcome to a Conversation with History. I'm Harry Kreisler of the Institute of International Studies. 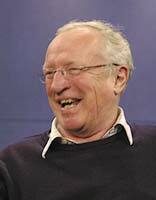 Our guest today is Robert Fisk who is the Middle East correspondent for The Independent newspaper of Great Britain. He has lived in the Middle East for almost three decades and holds more British and international journalism awards than any other foreign correspondent. He is the author of Pity the Nation: A History of the Lebanon War, and most recently The Great War for Civilization: The Conquest of the Middle East. Robert Fisk is visiting Berkeley to speak at a meeting of MECA. MECA is the Middle East Children's Alliance, and is committed to protecting and advocating for the rights of all people, especially children. Wartime Journalism ... determination to speak freely ... euphemisms and desemanticization ... covering up the ugliness of war... life-changing event: Sabra-Shatila massacre ... passionate truth-telling ... myth of "impartiality"